Thank you for wanting to learn more about blepharoplasty and related eyelid surgeries. As the leaders in eyelid and blepharoplasty surgery in Houston for over 25 years, we will share our perspective on this group of widely variable surgical procedures. Blepharoplasty [blef-ah-ro-plas-tee] means plastic surgery of the eyelid and is derived from blepharon, Greek for “eyelid,” and plastia or plastos, Greek for “molded,” “formed,” or “reshaped.” In common use today, blepharoplasty is generally used to mean the removal of eyelid tissue to improve appearance or increase vision. For many people, a blepharoplasty is a defining cosmetic procedure and can have as much, if not more, impact than any other facial procedure. Why? Because when you first walk into a room and look at someone, you look at their eyes. Did they notice that you entered? Are they happy to see you? What do they think of what you are saying? Expression, alertness, interest, and awareness are most strongly conveyed through the eyes. So in conversation, the eyes become an observer’s focal point of attention in the face. An impression made by the eyes carries over to the whole face, and then to the whole person. First impressions truly do count. Studies have shown that sleepy, saggy, bulging, or wrinkly eyes convey undesirable messages about both personality and total body wellness and fitness. 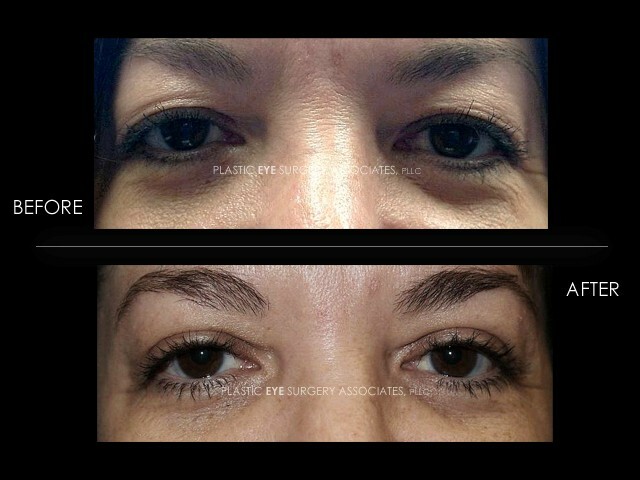 Not surprisingly, blepharoplasties and related eyelid surgeries are among the top three most commonly performed cosmetic surgical procedures both in Houston and across the United States, ahead of brow lifts, face lifts, and liposuction, but usually falling behind breast augmentation/reduction and rhinoplasty (nose surgery). Even so, according to the American Academy of Plastic Surgeons, the average, busy plastic surgeon performs 23 eyelid surgeries or blepharoplasties each year; roughly one every other week. Compare this experience to ours, where our doctors typically perform over 20 blepharoplasties and eyelid surgeries each week, or more than 1,000 / year, every procedure carefully customized to each individual’s needs, since there are many different “types” of blepharoplasty. As leaders in eyelid and blepharoplasty surgery in Houston with a widely recognized international reputation, other physicians often ask us how we perform our blepharoplasties, seeking a set formula to follow. Although we teach some basic principles, the fine details and the final combination of the multiple variables always change as we individualize surgery for each person, trying to gain the appearance of greater symmetry, augmenting existing facial strengths, minimizing any existing undesirable features, and making all our work appear as natural and invisible as possible. No two people’s faces or even eyelids are the same, so why should their blepharoplasties be? In this light, we find it bewildering when patients come to our practice distraught over prior eyelid surgery and report that their surgeon told them, “I don’t know what went wrong. I do exactly the same surgery for everyone.” In part, this explains why 50-70% of what we do every month is re-operating the work of others. In assessing a person’s aesthetic needs, many factors must be taken into account to provide an individualized solution. The first and most important factor in deciding what needs to be done is to understand each person’s goals. Are they wanting to appear less tired, younger, more masculine, more feminine, slimmer, brighter or achieve a perceived, subtle change in ethnicity between Occidental, Eurasian, and Asian? Do they find their eyes too bulgy or too squinty? Are they seeking change in just the upper or lower eyelids or in all four? In general, compared to the female eyelid, the male upper eyelid should be left relatively fuller, heavier, and with slightly greater skin redundancy. Raising the eyelid crease (break point) and over-sculpting the upper eyelid are sure ways to feminize the male eyelid and face. Heavy brow fat, skin, and muscle should generally not be left hanging out toward the ear, but in a female eyelid, this area is usually much more tightly sculpted. These rules, however, can be purposefully bent or broken, if a person wishes to gently soften an overly hard male face or bring strength to an overly effeminate woman’s face. 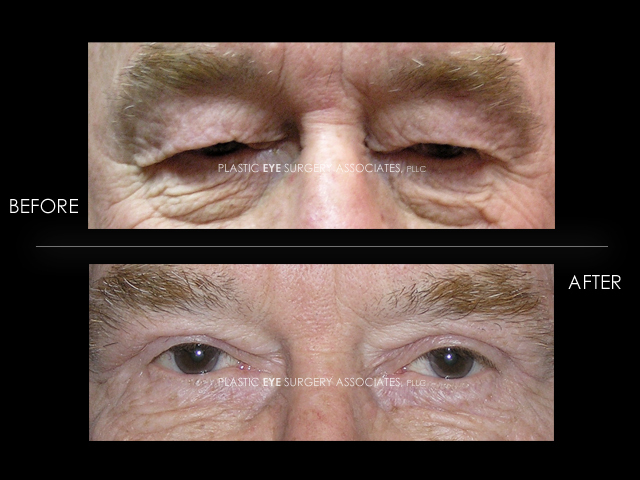 The benefits of upper and lower eyelid blepharoplasty surgery continue throughout life. People continue to age, of course, and so do their eyelids and faces. In general, though, one may think of an upper eyelid blepharoplasty “lasting” 10-15 years, depending greatly upon skin care and brow position, whereas a lower eyelid blepharoplasty generally “lasts” about 10 years, depending greatly upon the stability of the mid-face. Doing “more aggressive” surgery to “make it last longer” is not a sensible approach. Not many people ask their hair dresser or barber to cut their hair even shorter, sacrificing current appearance so they don’t have to come back again for a few more months? Yet, the degree of surgical correction is often influenced by other planned future facial rejuvenative procedures. Eyelid surgery needs to be appropriate in the context of other aging changes in the face. Nobody wants a 20-year-old’s eyelids on a 70-year-old face. So, overall facial structure and features must be considered as well as a person’s plans (or lack thereof) for other rejuvenative procedures. In contrast to what most people immediately think, a younger eyelid is a fuller and less sculpted, but without hanging bags and sags. A more mature eyelid is often more defined, more sculpted, and a little line around more mature eyes is often desirable, providing a natural, relaxed, and happy appearance. Race is an extremely important consideration. Although populations have obviously mixed considerably, there remain subtle, but important differences in the contour, weight, and shape of upper eyelids among African Americans, Southern Europeans, Celts, Native American Indians / Central and South Americans, Arabs, Asian Indians, Eurasians, and Asians. Asians, in particular, deserve special mention since variations in upper eyelid crease position, size, and type can be profoundly important. In the vast majority of cases, people do not want to become “westernized” or “Americanized,” but simply reverse some of the changes they’ve undergone over the years. If a true change is desired, we find most often that people of rich ethnic backgrounds most desire to approximate paragons of handsomeness or beauty in their own culture and race. They are not looking for a “cookie cutter” stereotyped solution. The single most important factor in determining whether similar eyelid surgery is conducted on both eyes is pre-existing facial asymmetry. Often, people will have one eye farther forward or lower than the other. There may be differences in upper eyelid height, in cheek projection, eyebrow position, or skin changes from having one side of the face always turned toward the sun (a hazard in some occupations). If asymmetries are not recognized before blepharoplasty and eyelid surgery appropriately adjusted, then asymmetries will be more apparent afterwards, when the visually distracting extra eyelid skin and bags have been removed. Careful planning can minimize the perception of asymmetry after surgery. A prominent forehead or bone projection above the upper eyelid often requires three adaptive changes: 1. Relative elevation of an eyelid crease, so that the eyelid can show deep within the shadow of the overhanging brow, 2. Relatively greater fat sculpting, to accentuate the upper eyelid, 3. Consideration of elevating the upper eyelid edge to make an eye lost in shadow appear larger and farther forward. In severe cases, the eyes can actually be brought forward in a procedure that is far easier than might be imagined. Conversely, a receded forehead or under-projecting bone above the eyelids generally requires an opposite set of adjustments, or the forehead can be brought forward either with surgery or temporary dermal fillers. Although brow lifts (upper face lifts) are extremely popular among plastic surgeons, one must critically review whether or not an elevated brow position has an aesthetic appeal or not for each individual. In men, this can be profoundly feminizing. In women, there may be a “frozen,” “surprised,” or “operated” look after surgery. For most, if the eyebrow falls on the edge of the projecting forehead bone in women or just below this bone in men, this is a good eyebrow position. In some, however, a droopy eyebrow on one side (or both) needs to be addressed. Failure to recognize this need before blepharoplasty may lead to a situation where so much tissue is removed in the blepharoplasty that when the brow lift is performed, the eyelids are no longer able to close – a disaster! The lacrimal glands reside in the upper, outer edge of the eye socket (the bone cavity in which the eye sits). This gland is responsible for making a large component of the tears that normally bathe the eyes. In some people, the attachments of the gland to the surrounding bone relaxes, and the gland descends into the eyelid where it may be mistaken by an infrequent eyelid surgeon for fat and removed. Removal of the lacrimal gland can cause a major dry eye problem after surgery, and a dry eye of this magnitude may not only be annoying, but could easily be extremely painful and threaten the health of the eye. Conversely, not recognizing that the gland has fallen and carefully repositioning it will result in an unsightly bulge in the outer corner of the upper eyelid after surgery. A change in the upper eyelid height (position of the eyelashes relative to the center of the eye) should never be significantly influenced by how much eyelid skin is removed. Raising the upper eyelid height (ptosis repair) is accomplished by carefully identifying and tightening the major muscle responsible for eyelid elevation. Lowering the upper eyelid is also possible by repositioning this same muscle. Changes in the upper eyelid height may be performed if one or both eyelids are droopy, if eyelid position asymmetry exists, or if the eyes are too widely open. Additionally, changing the eyelid heights can simulate moving the eyes forward or back, making them appear larger or smaller, as desired. Changing the position of the lower eyelid (raising or lowering) can be a more complicated endeavor, but is also very possible and routinely performed in our practice. The overall shape of the eye (“round eye,” “sad eye,” “almond eye,” “cat eye,” “Asian eye,” etc) is determined to a large extent by the position of the corners of the eye (one near the nose and the other towards the ear). The relative positions of these canthi (or corners) one to the other as well as to the eye and surrounding tissues can have a big impact on upper and lower eyelid positions, tightness of the eyelids against the eye (important for lubricating tear movement and eye health and comfort), and the final shape and aesthetic appearance of the eyes. Frequently, modification of these angles is an essential part of a successful blepharoplasty. For more about eye shape and the importance of the canthi, explore here. The relationship of cheek projection relative to the eye position is extremely important when considering lower eyelid blepharoplasty. Looking from the side, the cheek should project beyond the eye or to the same degree. If the cheek is receded relative to the eye position, extreme care must be taken to avoid lower eyelid descent after surgery resulting in cosmetic deformity and severe dry eye problems. Several options exist to correct a cheek-eye projection mal-proportion, depending upon each individual’s needs, including resuspension of the cheek and eyelid muscles, transposition of fat from behind the eye to the top of the cheek, and cheek implants. When assessing a lower eyelid for possible blepharoplasty, multiple bags and folds are often present. Many of these represent descended fat pads or muscle groups (generically called festoons) within the top of the cheek. The cause of each of these must be determined and, if desired, addressed during lower eyelid blepharoplasty. Otherwise, only half of the lower eyelid-mid-face issues will have been corrected. We are frequently asked by physicians and informed patients alike whether or not we remove or transpose/reposition the fat, make skin incisions, remove skin, and remove some of the Orbicularis eyelid muscle that helps the eyelids to close. The answer, of course, depends upon each individual eyelid and what we are trying to accomplish. We have some general rules we follow, but even these are often broken when necessary. In short, careful consideration of all these options must be part of the final surgical plan. Perhaps the single most devastating feature neglected or misjudged by many plastic surgeons in their preoperative blepharoplasty assessment is the quality of the skin. Fine wrinkles in the skin from allergy, sun exposure, smoking, chronic poor hydration, and certain disease conditions reflects damaged skin, not excess skin. Pulling the eyelid skin so tight during surgery that these lines completely vanish will invariably lead to incomplete eyelid closure, exposure of the eye, and serious, painful, vision threatening dry eye. Ignoring the presence of severe sebaceous hyperplastic changes or Rosacea may lead to prolonged healing and even scarring. Peering into the future is always helpful. Photographs of older siblings and parents may indicate strong familial traits that might be proactively addressed. There are many disorders which may significantly affect the timing and degree of cosmetic eyelid surgery. Not only do these need to be recognized, but they may certainly require specific considerations and alterations in surgical plan. Such conditions include Floppy Eyelid Syndrome (tightly correlated with sleep apnea), autoimmune thyroid eye disease, muscular dystrophies, neurologic disorders, rheumatoid arthritis, lupus, diabetes, psoriasis, and other autoimmune disorders. Interestingly, many of these conditions may be diagnosed just by looking at the eye. When we lecture to general plastic surgeons and facial plastic surgeons, we are frequently asked to describe the best eye tests to “clear” a patient for a blepharoplasty. There is no check box on a person’s forehead that you can mark and say, “this patient is safe (or not safe) for eyelid surgery.” One patient with profound dry eye and very heavy upper eyelids may be an excellent candidate for blepharoplasty, because he suffers from a condition we described called Frontalis Antagonist Blink Syndrome, whereas another patient with mild Toxic Tear Syndrome should definitely not have surgery before the tear problem is resolved. Undertaking cosmetic eyelid surgery, blepharoplasty, is a complicated matter, as evidenced by the large number of patients who come to us for revisions of other surgeons’ work. Having said that, it can be a very rewarding, completely painless, fast, and relatively inexpensive path to significant rejuvenation performed in the office under local anesthetic. There are very few absolute indications or absolute contraindications to cosmetic eyelid surgery or blepharoplasty. Every person’s situation must be carefully considered in the light of all of the factors we’ve described here, and the surgery must be thoughtfully tailored to each person’s needs to best meet their goals. If you visit or have visited our office for a consultation, we may or may not verbalize our assessment of each of these factors, unless you specifically ask, but you can be certain that every one of them is integral to the formulation of your unique surgical plan.